Annual incidence is about 1 in 100,000 patients per year. There may be a slight female predominance. The tumor most commonly presents in the fifth and sixth decades. As acoustic neuroma is a slow-growing tumour; symptoms often develop gradually over several years. The most common symptom is loss of hearing in the affected ear. This may be accompanied by a buzzing or ringing noise in the ear (tinnitus) and a feeling of fullness in the ear. People may experience dizziness and have problems keeping their balance. If the tumour is pressing on the nearby nerve that controls feeling and sensation of the face, it can cause numbness or tingling of half of the face. Rarely, the facial muscles can become weak on one side. Larger tumours may lead to a blockage in the flow of cerebrospinal fluid (CSF), causing headaches and changes to your eyesight. People who develop acoustic neuroma as part of type II neurofibromatosis usually have tumours affecting both sides of the brain (bilateral tumours). • Hearing loss, unilateral tinnitus, balance problems, vertigo, facial pain (trigeminal neuralgia) and weakness, difficulty swallowing, fullness or pain of the involved ear, and headache may occur. • With elevated ICP, patients may also suffer from vomiting, fever, and visual changes. • Hearing loss is the most common presenting complaint and is usually high frequency. The etiology is incompletely understood. Bilateral acoustic neuromas may be inherited in an autosomal dominant manner as part of neurofibromatosis type 2. This disease is associated with a defect on chromosome 22q1. • A detailed neurologic examination with special attention to the cranial nerves is crucial. • Otoscopic evaluation may help to rule out other causes of hearing loss. CSF protein may be elevated. • CT scan with contrast can detect tumors 1 cm in diameter or larger. • MRI with gadolinium is the most sensitive noninvasive test and can detect tumors as small as 2 mm in diameter. Treatment decisions should be based on the size of the tumor, rate of growth (older patients tend to have slower-growing tumors), degree of neurologic deficit, life expectancy, age of the patient, and surgical risk. • Surgery is the definitive treatment. Choice of approach (middle cranial fossa, translabyrinthine or posterior cranial fossa) may vary depending on the size of the tumor, amount of residual hearing, and degree of surgical risk that can be tolerated. Partial resection is sometimes undertaken to minimize the risk of injury to nearby structures. Intraoperative facial nerve monitoring is recommended. • Radiotherapy has been used to treat tumors that are less than 3 cm in diameter. Radiotherapy following partial resection has also been used to minimize complications. • Observation may be appropriate for older or frail patients with small tumors, but serial scanning may not be able to detect neurologically significant growth and risk may be higher if surgery is delayed. 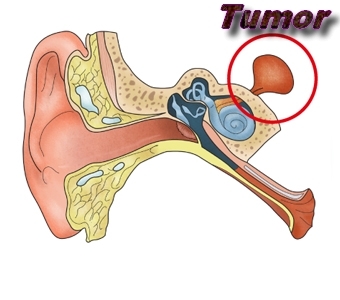 Hearing can be preserved at near preoperative levels in more than two thirds of patients with small- to medium-sized tumors. Acoustic neuroma is a benign proliferation of the Schwann cells that cover the vestibular branch of the eighth cranial nerve (CN VIII). Symptoms are commonly a result of compression of the acoustic branch of CN VIII, the facial nerve (CN VII), and the trigeminal nerve (CN V). The glossopharyngeal nerve (CN IX) and vagus nerve (CN X) are less commonly involved. In extreme cases, compression of the brainstem may lead to obstruction of CSF outflow and elevated intracranial pressure (ICP). The vestibular nerve is responsible for balance, and the auditory nerve is responsible for hearing. The acoustic neuroma starts from schwann cells, which cover the nerve and is sometimes therefore called a schwannoma. It is a slow-growing benign tumour and does not spread from its original site within the brain.